About Dr. Dean Goodman D.C.
Dr. Goodman has practiced in Santa Monica for the past twenty-nine years. He specializes in the treatment and prevention of athletic and work-related injuries. His approach to total health care and fitness emphasizes the importance of exercise, nutrition and mind/body alignment. 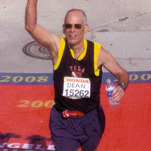 He is an accomplished long-distance runner who has completed over 30 marathons. He specializes in injury prevention, health maintenance and self-care and has published numerous articles about health, fitness, natural healing and longevity. I used to get migraines nearly once a week, but after receiving treatment from you on a regular basis, my life and my health have changed for the better. Of course, I still get an occasional headache every now and then, but the migraines which used to leave me nearly bedridden have completely disappeared. Thank you so much for opening my eyes to chiropractic care and helping me realize that I don’t need to take an Advil to get results!!! — Tara H.